Well lets start off by saying work is incredibly busy, just like I knew it would be all this year and for a few to come. It's great to be busy and have so much to learn. But sometimes when you need time off it's not so great. You will soon know what I'm talking about. But since my work hours are flexible, I can fix my schedule as I need. I got this terrible cold that took over me for a week. I can't even remember when, but it was bad. I was in bed for 2 days. All better now. Misifu, my other kitty, she is a 7.5 year old Calico, has a lump on her right rear leg. When I first noticed it was pretty big. I think the vet said it was 1" x 2". I have been really watching all of my pets, checking them out being more vigilant and that's the reason why I felt that lump. We took her into the vet and she wasn't too worried and said to watch it over for a month and see if it grows or if we wanted she could aspirate it to find out what was in it. She still said she wouldn't do anything she still wanted to watch her for a month. So that's what we decided, just watch her for a month. In a week her lump has gotten smaller, I compare it now to the size of a pea. The vet is thinking is a reaction from the vaccines that she received in January. We'll know in April. But it looks good. Granted she still gave me a scare last Friday when I got home. She was limping from the same leg she has her lump. But I think she and Diasque got into a cat fight because he was crying from one eye and was a little swollen. By the next morning they were both back to normal. Diasque has been doing great with his insulin. We have him regulated, I have been checking his urine for ketones and sugar levels. Both are negative, yippie!! He is letting us give him the shots easier than before. So a big victory there. We have had a few times when he is just fed up, but we get thru it. He is back to being an overjoyed kitty and plays all the time. This week was especially hard. On Monday night my dad was admitted to the hospital. Around noon he was out for his normal walk, and he felt shortness of breath, chest pain and dizzy like he was going to faint. He went back to his car and he says that it just got worst, including pain down his left arm. He drove himself home and went to his room to try to get a blood pressure reading and the machine wouldn't work. I'm guessing his blood pressure was going crazy. He felt better about 20 minutes after that and was finally able to get a reading, he said that it was around 150/90. Because he felt better, he didn't tell my brother who was home, he went to pick up my mom later and didn't really tell her the full glory details. I got home around 730pm, just in time to give Diasque his insulin shot, when my mom tells me that I need to talk to my dad because he had a bad day and that he needs to tell me all of it. I tried to get him to talk to me but he wouldn't. After about 15 mins he started telling me. Suzy and Pattie were waiting for me outside to go to our usual La Fondue night. I sent my brother to tell them that I couldn't go with them. As I'm learning all of these things, I keep telling him if what he felt was the same way he felt before he had his cardiac arrest and whether his defibrillator had given him a shock. He said that it was different and that no he hadn't had a shock. But seriously, classic heart attack symptoms. Then he tells me that he still feels a little of pain on his left side of the chest. HELLO DAD let's go to the hospital right now or better yet 8 hours ago. We get at it, he is not budging, saying that they won't see him until maybe around 1 or 2 in the morning. I'm really stressed and walk away, my mom continues and she comes to me a little later and says that she almost has him convince that I should try again. I go and tell him, and he finally agrees. We get to the ER, he is not even done with the admitting nurse and the triage nurse is calling his name. The triage nurse is not even done and he is already being taken to a trauma room. All of the nurses and doctors told him the same thing: "DO NOT WAIT THIS LONG, YOU COULD HAVE BEEN HAVING A HEART ATTACK FOR THE LAST NINE HOURS" They did an EKG within 5 minutes, had him on oxygen and a heart monitor. His BP was still pretty high 160/94 or so, 94% on oxygen, 64 heart beats per minute. They ran a bunch of labs. The time went by fairly quickly, I think the ER doctor came in about an hour after we got to the ER. She said that they weren't sure if he had a heart attack but because of his history they were going to admit him, she was going to wait on the lab results, but most likely he would be admitted. Around midnight the admitting doctor came into see him and told us he was being admitted. That the test didn't show a heart attack but they wanted to run some more test the next day and do a stress echo. They only thing they found was that his potassium was a little low, but not dangerously low. So they gave him 2 horse pills of potassium. His breathing was better quickly 99% with the oxygen tank and his chest pain was taken care by Morphine. By the next day he was breathing without the oxygen tubes. He was in the hospital until last night. They didn't find any signs of a heart attack from the lab tests and the stress echo didn't reveal anything new. So they sent him home. He is so much more happy to be there. But seriously, I hope he has learned that when it comes to the heart, don't wait, just go. I even mentioned the case of Natasha Richardson on our way home. It's such a sad story, that I'm sure happens more often than we know. My dad could have been the same too, we never know. So after all this, if you are still reading this. Please make sure to go see a doctor whenever you feel something is not right. Don't hesitate to go the ER if it's an emergency or urgent care after hours. My dad was lucky that it wasn't a heart attack, what they believe might have happened is that he overworked himself and as he was walking he was asking too much of his heart and his heart couldn't take it, so he needs to take it easy. I'm excited that tomorrow will be a day of scrappin' all day long. 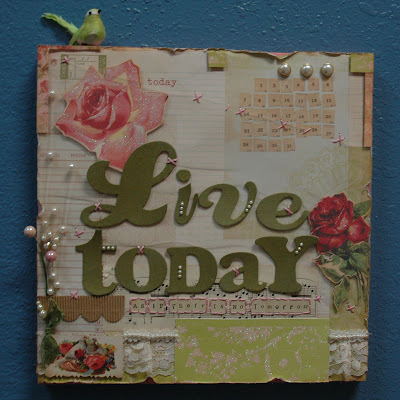 I'm going to scrapbook expo and do the 8am-1130pm all-day crop with Debbie, Rhonda, Patty and Eva. I have even asked my family to help me with Diasque's insulin shot at night so I can stay the whole entire time. It should be so much fun. I have to finish a project. Hopefully tonight I can sleep, as this entire week I haven't been sleeping much. Take care and hug your loved ones and make sure you tell them how important they are to you. Since I still don't know when I'm leaving to France, I decided to keep up with my obligations and try to finish early. With that I completed my March entry to the CJ Challenge. This month we had to use favorite quote or scripture. I decided to use a quote, "Live today as if there is no tomorrow", it really captures how I hope to live my life, hence the title of my blog. It's a 12x12 Canvas. I used the K&Co Cut-n-Paste Paper line, I used the plain paper as my base and the glitter paper (same design) I cut it up and used pop dots to give me dimension. I also used pearls galore of all sizes. I cross-stitched over tulle and over some letters. Used some vintage music sheet, ribbon and lace. I glimmer mist the canvas with Vintage Pink, it worked so great with my colors. The chipboard letters were also glimmer misted with Olive Green. I love how it all came out. It's so shabby chic. I just love those colors, pink, green and ivory/pearl.